Your Notify.com implementation is accessible from any smartphone , tablet or desktop . No special hardware is required to access your Notify.com account. Notify.com can be run locally, at your site , behind your firewall. Or you can choose to run as a hosted application, using the provider of your choice. 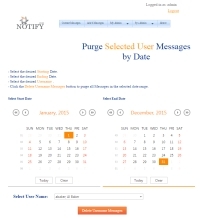 Notify.com is an acknowledgement-based notification platform. 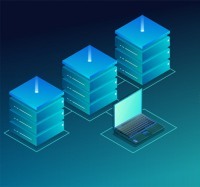 The Notify.com Administrator can grant users the ability to define their own escalation chain of notification; specifying the start time , and number of retries for all forms of messaging. 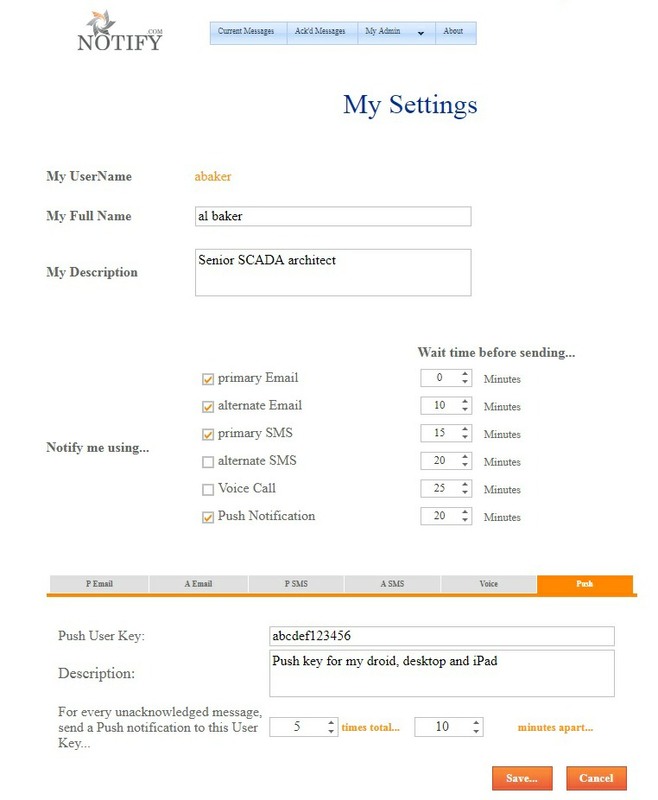 In this example, user Al Baker chooses notification to start with Primary Email , followed by Alternate Email , an SMS text message, and finally, if necessary, 5 Push notifications, at 10-minute intervals. This escalation chain of notification will continue until Al acknowledges receipt of the message. Notify.com implements a unique acknowledgement feature called One Touch Reply . 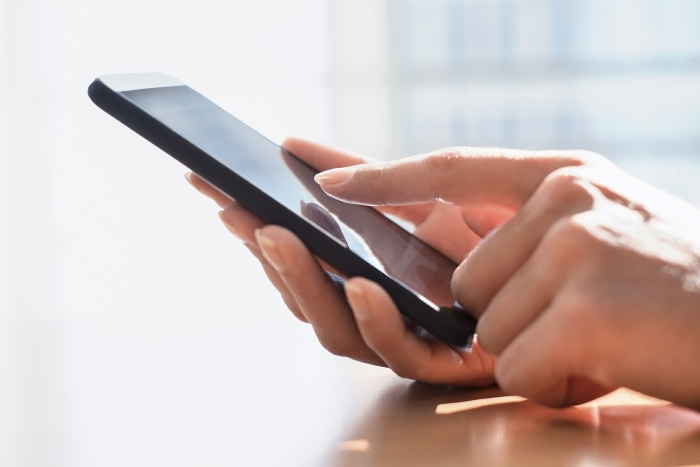 This capability allows users to acknowledge their message, with a single response to the system—they do not need to enter the associated Message ID. 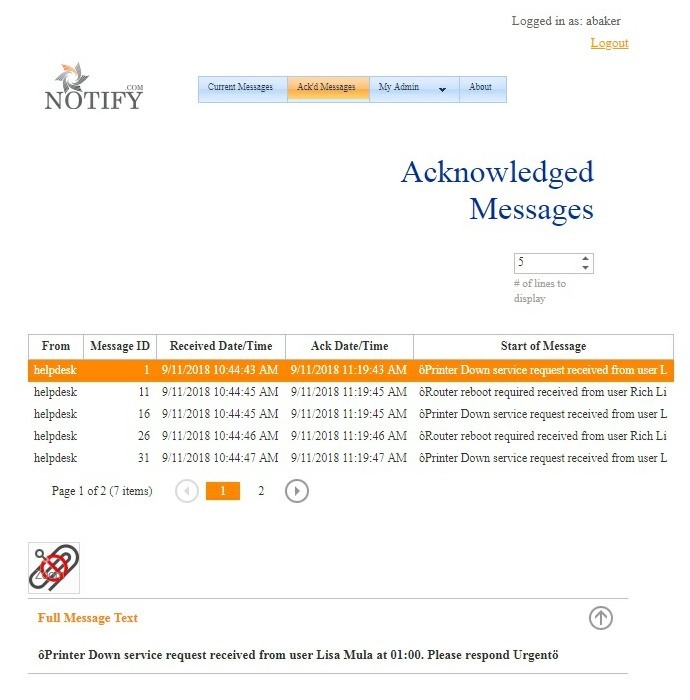 Users simply click the acknowledge button on their Push notification, reply to their SMS text message or Email, or press a defined key sequence on the telephone keypad when receiving a voice call, and the Notify.com message is acknowledged. 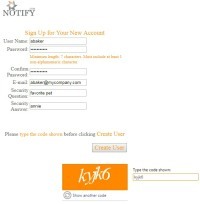 All Notify.com implementations have the option to allow user self-registration . 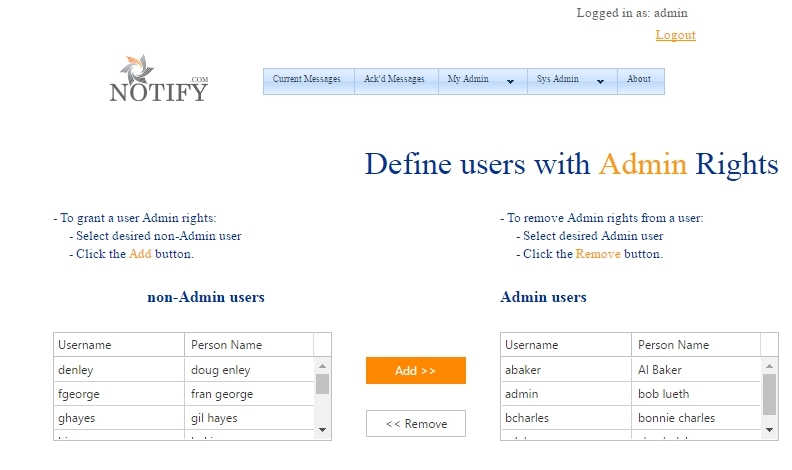 This capability eliminates significant Administrative overhead in configurations with large numbers of users. Notify.com messages are always available for review . 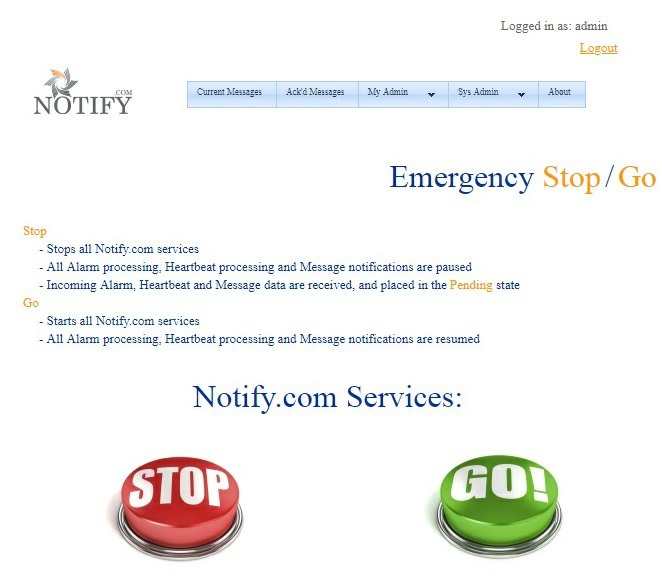 It doesn't matter if the message was sent yesterday, last week or last month–every Notify.com message is archived. Just click on the top of the desired column, and the data is sorted in ascending or descending order, based on the user's preference. 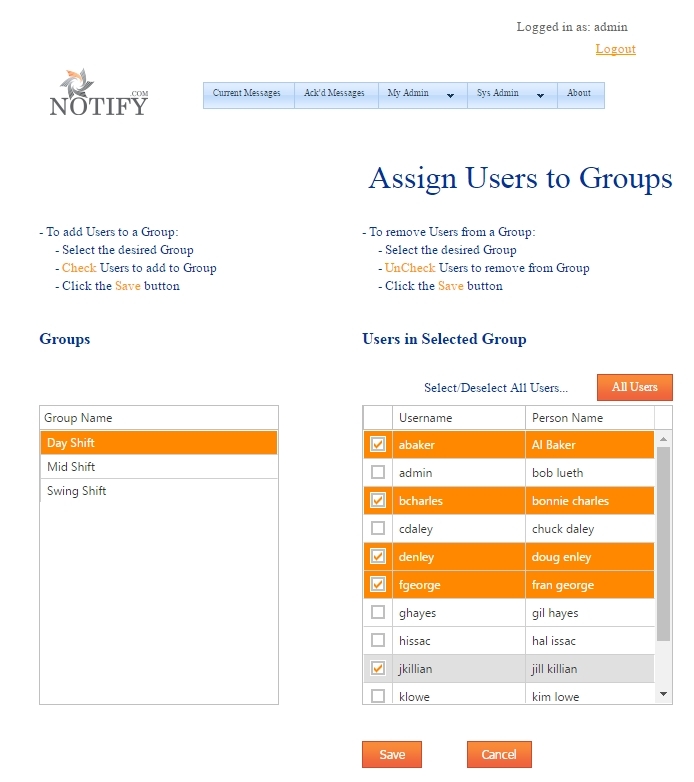 Notify.com Groups provide a quick and easy method to send the same message to more than one person at a time. 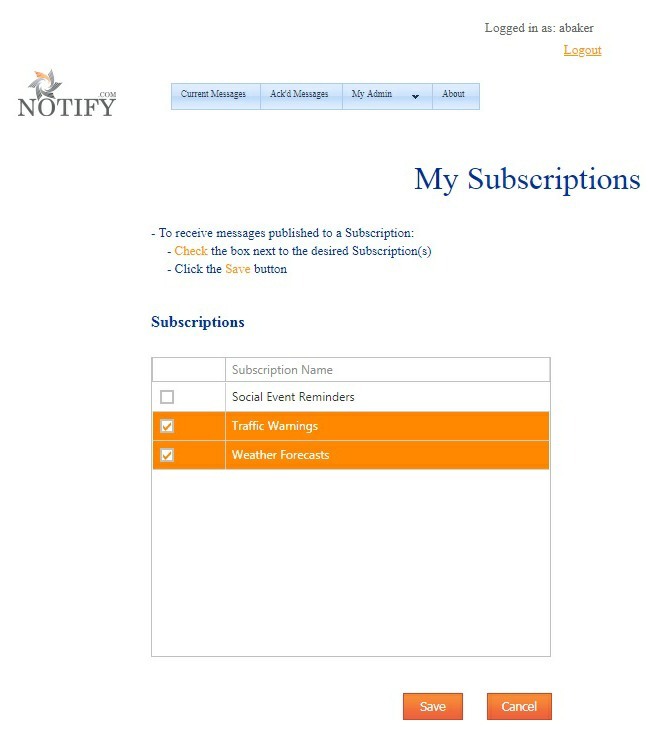 When enabled by the system administrator, Notify.com Subscriptions give individual users the ability to Opt-In to organizational message broadcasts. The Notify.com Message API is accessed via a simple HTTP POST request. This common, easy to implement web interface, provides fast, straightforward integration with any Operating System , application or device. 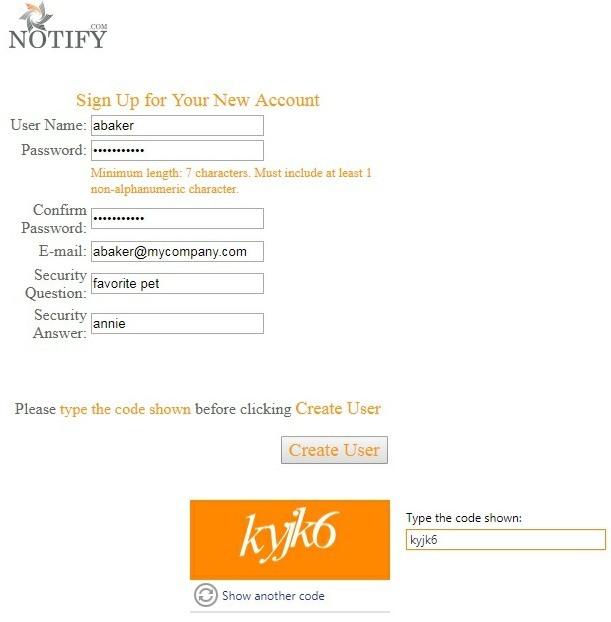 Notify.com messages can be a combination of text, and images . To view images, Notify.com users access their account from their desktop, tablet or smartphone. 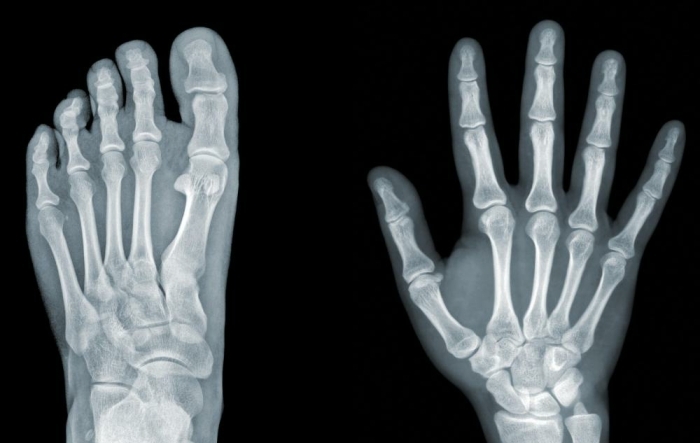 This allows images to be viewed in full resolution ; for those situations where image details are critical. Note: A comparable image, sent to the smartphone using the MMS protocol, is often reduced in size by up to 90%. Administration... 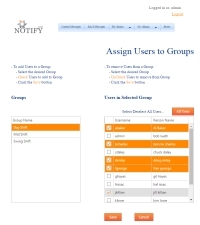 When a Notify.com user has been granted Administrative Rights , they have the ability to view and update system-wide settings. Administration... 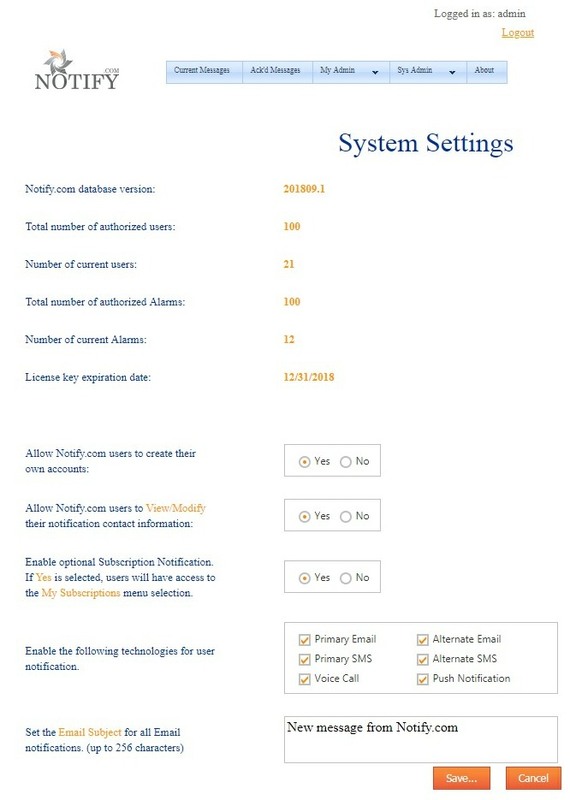 The System Settings page allows Notify.com Administrators to modify global settings that affect every user of the system. 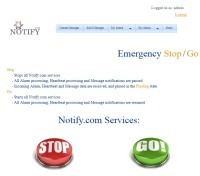 Administration... Notify.com can be configured for redundant, high availability operation. Loss of connectivity to the primary system will result in immediate failover to the backup. 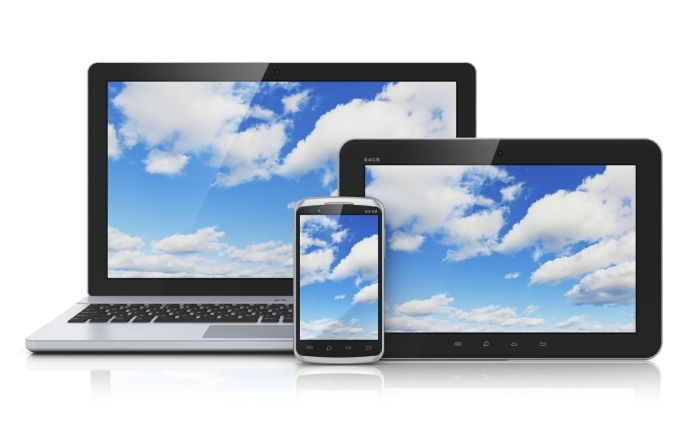 In addition, cloud-based notification technologies can be supplemented with on-premise solutions . 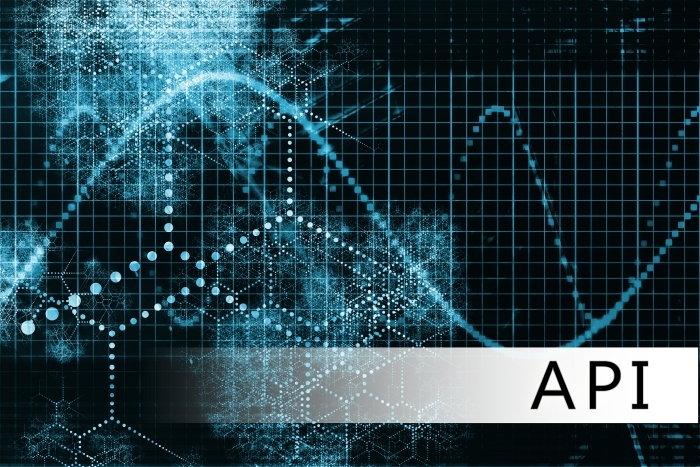 This capability provides a path to alert notification; even when Internet connectivity is not available. Administration... Sometimes, things don't go as planned. You meant to send the message to the Group of 10 people, but accidentally sent it to a Group of 250 people. In situations like this, it is nice to have the ability, to easily suspend all system operation , until the problem is resolved. Administration... Periodic maintenance is a snap for Notify.com Administrators. 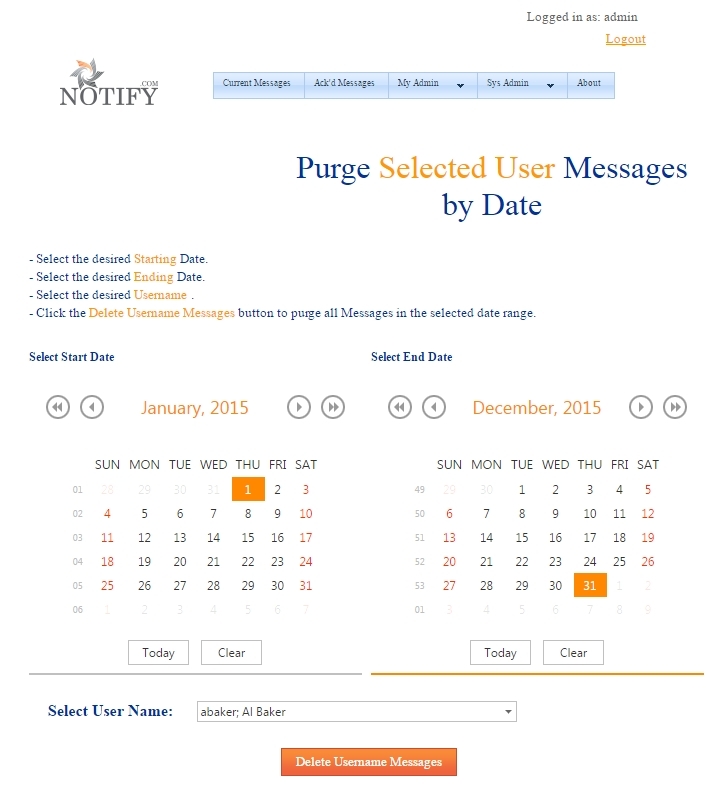 System data can be purged based on any selected time period.